New food on the diet: rabbits and birds! A new study from our team has just been published on the journal African Primates! We report a series of observations, for the first time in the wild, on the capture and consumption of two prey items which previously had not been reported in the diet of the Barbary macaque: adult European rabbit (Oryctolagus cuniculus) and chicks of the hoopoe (Upupa epops). Our study highlights the flexibility of the macaques in terms of feeding behaviour. 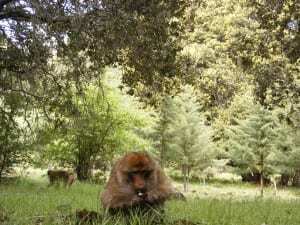 Young CA, Schülke O, Ostner J, Majolo B (2012) Consumption of unusual prey items in the Barbary macaque (Macaca sylvanus). African Primates, 7: 224-229. ← Monkeys playing on slide?